LISBON, Portugal, 9 May 2018 – The Metro-Haul Project, a Horizon 2020 European Union research and innovation program, today announced the successful completion of its third plenary meeting. More than 50 people from across 21 companies and universities spanning 8 European countries have just attended the highly productive project plenary meeting hosted by Coriant in April at its R&D facilities in Lisbon, Portugal. The meeting highlighted the practical points of convergence for access and metro networks, and the establishment of suitable architecture and fundamental structure of future metro networks. Discussions also included the critical role of storage, compute, and virtual function capabilities; underpinned with flexible and elastic optical nodes in support of the demands of the 5G network. These plenaries provide opportunities for heated and productive discussions: a notable outcome for the most recent session led to significant advances in understanding of how transponders from different vendors can be configured and operated using common data models. 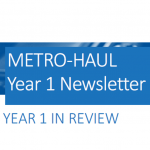 Metro-Haul is already significantly exceeding its stated KPIs with over 90 separate research papers, journal articles, and conference presentations published or accepted for publication within the ten months since the start of the project. The recent OFC conference held in San Diego in March 2018 was a notable success, achieving no fewer than 23 Metro-Haul contributions including papers, invited talks, workshops, and tutorials.